An unparalleled combination of attitude and luxury, Buckhead Grand is a highrise like no other. The building decor is funky and hip, but this 5-star condominium offers classic service and amenitites. Elegant living spaces bathed in sunlight through floor-to-ceiling windows accessing panoramic views of Buckhead's thrilling skyline is among many remarkable luxurious living features at Buckhead Grand. The gourmet kitchens at Buckhead Grand feature granite counters, stainless GE Profile appliances and 42" cabinets. Other luxury amenities at Buckhead Grand include hardwood floors, 9-foot ceilings, marble soaking tubs, panoramic views and terraces. Listing information last updated on April 24th, 2019 at 7:15am PDT. 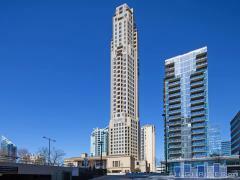 Have any comments or questions about Buckhead Grand Condos? Ask your question and/or share your thoughts about this Building. What is Buckhead Grand's policy regarding pets? What are the monthly HOA fees? Interested in renting with option to buy if that's an option. Moving from Los Angeles this month.